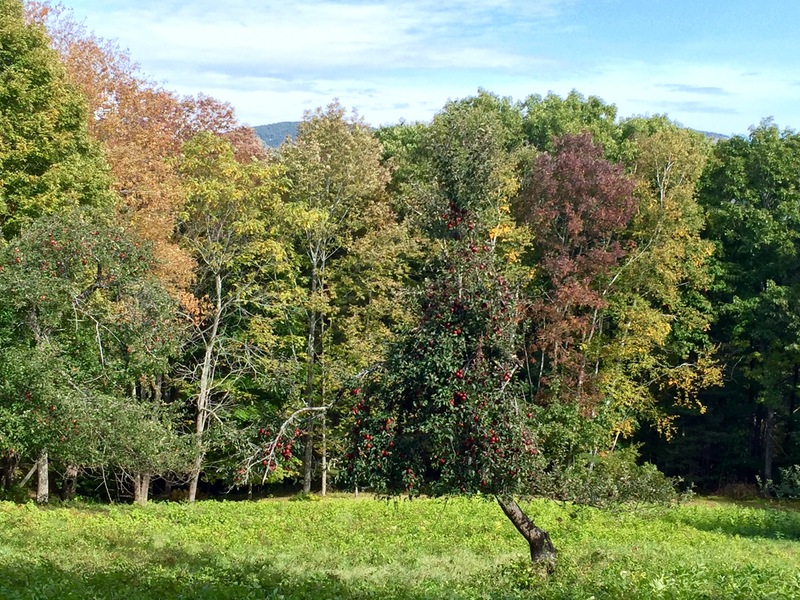 The nights have cooled, and the trees are starting to turn. Finally. Hope’s Edge CSA (Community Shared Agriculture) farm has two more weeks to go. I will miss going out there weekly so much. The long orange one in the back is a pie pumpkin. I’m going to roast/carmelize it and use it in a salad recipe from Jennifer McGruther’s book The Nourished Kitchen. (Search on this blog for more info.) The recipe pairs the sweet pumpkin with bitter greens, nuts, and balsamic vinegar, among other ingredients–as well as I remember. The funny looking veggie to its left is a rutabega. I cook it like a potato. Rutabegas are great cubed in soups and stews. The flesh is buttery yellow and mashes well. 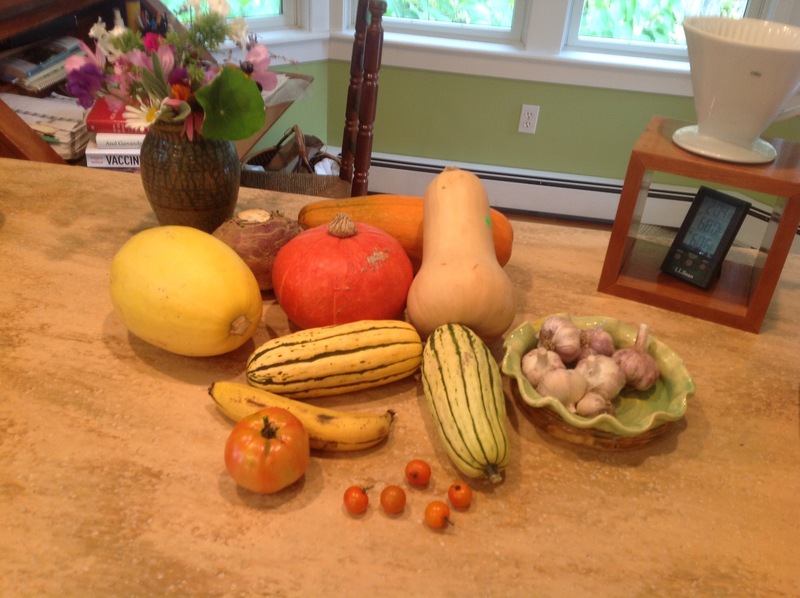 The oblong squash to the left is a spaghetti squash-one of my very favorites. I cut them in half, seed them, and roast them (cut sides down on a greased piece of parchment paper). Once done, run a fork through the flesh and it breaks into strands. I heavily butter and add salt and pepper. Scoop out the stands and put on your plate. This one reheats well too. The striped squashes are delicatas. They are so sweet that you don’t need anything in them but a bit of butter. I bought some one fall in Charleston, SC, and they were bitter and bad. This squash may need more of a New England climate to develop its sweetness???? The tan squash is a butternut. Mild and delicious. You can eat the skin on both delicatas and butternuts. I’m going to put it cubed into a stew with black beans, hamburger, and Indian seasonings–in the crock pot. How did that banana get into this picture? Mercy! The orange squash in the middle is a “Sunshine” and has a heavier, sweeter flesh. I’m going to cube it and roast it with garlic, rosemary, small potatoes, red onions, and chunked green tomatoes. It’s a dish to which I look forward every fall. I’ll make it while sister Susan is here next week. That’s likely the last large tomato to come out of the garden. I”ll get some Sun Gold cherry tomatoes though. The garlic crop is great this year. I’m loving all the fresh garlic in the kitchen. I’m missing a Blue Hubbard squash, which is a great keeper. I’ll pick one up though. That’s the last bit of annual flowers I’ll cut from the garden behind the squashes. 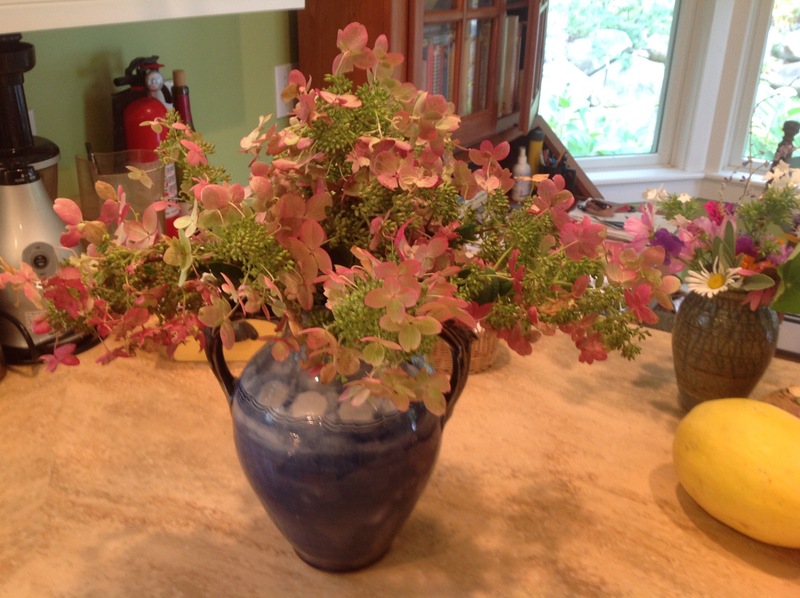 I cut these Panculata Hydrangeas this morning for the dining room. Hope they dry nicely. Local folks are making apple sauce, apple butter, drying apple slices, and making lots of apple pies. The girly dogs and I have been walking every day in this glorious fall weather. 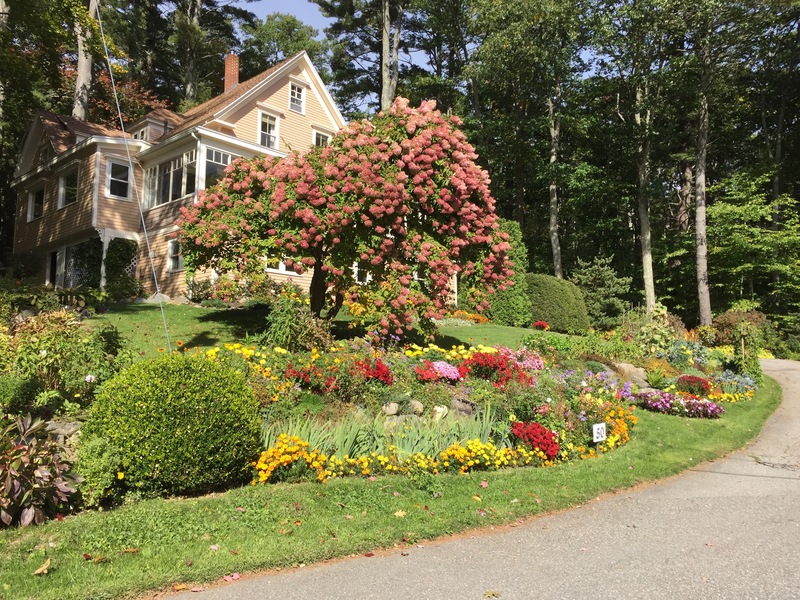 Sunday afternoon I drove by a friends Harry and Marsha Smith’s house to see their gorgeous fall yard. What a treat this view was!